1. Question: You offer a belt ranking system. Traditionally, Chinese Martial Arts, unlike their Japanese counterparts, do not offer belt ranks. Please explain this discrepancy. Answer: You are quite correct. Traditionally there were no belt ranks. Looking at how people are best motivated, having studied education at a post-graduate level, I had found that a step-by-step graduated syllabus with periodic feedback via gradings and positive reinforcement for hard work via belts was valuable to my students and thus began implementing this. I found it reassuring that the famous master Hung I Hsiang in Taiwan used gradings and uniforms within his Tang Shou Tao organisation going back to the nineteen sixties. More recently, Mainland China seems to have caught up. There hardly seems to be anyone coming out of there these days who is not an Eighth “Duan” in this and a seventh “Duan” in that (i.e. clearly echoing the Japanese “Dan” grading system). So, yes, that is a “non-traditional” innovation on my part. 2. Question: You stress that the kid’s Hsing Yi Kung Fu classes are “non-spiritual” in nature, i.e. a purely physical practice, outside of any cultural or religious framework. Does this not mean that you are “short-changing” your younger students? Answer: No, I don’t believe that I am. Children have enough on their plate without having certain spiritual beliefs forced down their throat by their martial arts instructor, especially when these beliefs may conflict with what they are learning at home or in their community. Children need certainty and stability so as to cope with all the given stresses of growing up, not more conflict and uncertainty. The bowing at the beginning and end of class are not some Oriental ritual, but just a courteous greeting as executed within a class context. Once someone has become an adult, they can then make their own choices with regards to every aspect of their life. I see a big difference there with my adult students and teach accordingly. 3. Question: Are the martial arts you teach the best martial arts? Answer: I wish I had ten Bucks for every time I’ve had to answer that one, I could build myself a stately mansion somewhere. First: Best for what exactly? Best for joyous movement? Ok, you might want to try Capoeira. Best as a super-tough ring sport? Try Muay Thai, if you bring your Capoeira, you’ll probably end up in intensive care. Does Aikido work? Against someone coming in with committed slashes with a knife, most likely. Against a good boxer with a solid jab, who controls his punches and stays within his center, not quite as much. Second: At what level of experience? Three months in the best combat system in the world will leave you wondering which limb to move first in a real fight, whereas ten years in a more “dance” oriented system may help you glide past an attacker and do the right thing, which is nearly always running for the hills. Third: Against whom? If you are having an argument about a parking spot with a pensioner using a walking frame (shame on you) anything will work, including that 360 degree spinning flying back kick you have been saving up for the occasion (I hope that you have a good criminal lawyer lined up, though). If you are facing a professional gangster with a weapon, good luck to you, unless your name is Jean Claude van Damme and the director has you down to win. Fourth: How good is your teacher in passing on his knowledge? Fifth: How hard have you worked to internalize his/her knowledge? ALL arts have something to offer to someone and all teachers who have active students quite obviously have something to offer, or else they would not have any students. What is important here is the following: DO YOU KNOW EXACTELY WHAT IT IS THAT YOU ARE LOOKING FOR IN WANTING TO STUDY THE MARTIAL ARTS? Read that question again, please. It is the core question. If you do, then all is well. Visit a variety of schools in your area and ask to either be allowed to watch a class or participate in a free trial class. Any school that does not offer at least one of these options should be treated with suspicion. Use your intuition and your mind to work out which one suits you best. DO NOT ask the teacher whether his style is best. Every teacher, by definition, thinks his style is best, otherwise he would have gone and studied the style or styles that he thought were best, wouldn’t he!? Plus, if teaching is his profession, he would want to “sell” you on the superiority of his system. So, sorry, you are going to have to work that one out yourself and it MUST start with defining for yourself exactly what it is you want to achieve in studying a martial art. Furthermore, NEVER ask me the question: “WHAT DO I THINK OF INSTRUCTOR/ SENSEI/ SIFU/ KRU X”. It is impolite, gossipy and somewhat immature on the part of the person asking such a question and it would be highly unprofessional on the part of any instructor to pronounce his opinion to someone he has probably only just met. There is a certain type of student who loves stirring up trouble between schools and instructors. If I get the sense that this is what a student is doing, I will ask him to leave. 4. Question: Should I stick with one art or try several (i.e. 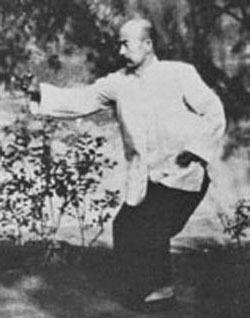 both Tai Chi and Hsing Yi, simultaneously, for instance. Or, perhaps, do Hsing Yi with you two nights a week and MMA at some other club on the alternate nights, for example). Answer: If you are a beginner, I believe it is better to stick with one art. To echo the philosopher Occam of Rotterdam: “Don’t multiply your entities unnecessarily” (“Occam’s Razor”). Different arts have different ways of moving the body, for instance. Studying two different ways of moving the body, as a beginner, will only lead to confusion. Studying the arts is about achieving clarity, not increasing confusion. Once you have reached an intermediate or advanced level you may then “branch out” and study other arts so as to refine certain qualities or abilities that those arts are perhaps specifically good for. 5. Question: Can I or should I use what you have taught me to defend myself? Answer: If you believe that there is a clear and present danger to your health because someone is about to attack you, the law of the land allows you the right to defend yourself up to that point at which the danger is no longer present and to a degree that mirrors the threat (being pushed by a drunk at a party does not give you the right to hit him full-blast in the windpipe, for instance). Inform yourself about the law. Avoid physical violence whenever or wherever possible. There is to my mind and in my rather extensive personal experience ABSOLUTELY NOTHING even remotely glorious or glamorous about physical violence. If you want to go and injure or kill people, join the French Foreign Legion. Better yet, find a really good psychotherapist. It’s very simple: If I hear of any of my students initiating violence or repeatedly “needing to defend themselves”, they may, on a good day, get one verbal warning. After that, I will ask them to leave. This is utterly non-negotiable. All of my teachers stressed what in Chinese is referred to as “Wu-Deh” (“martial virtue”), i.e. what we in the West would call a chivalrous and knightly code of conduct. Without that, as a teacher, you are merely turning out well trained thugs and I have not spent more than forty years in these arts so as to do that!